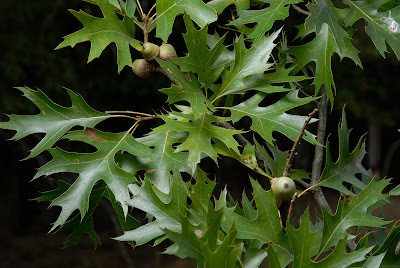 If you've read through earlier posts, you already know that pin oak acorns are a deer favorite. Pin oaks are members of the red oak family, which means that their acorns mature in the second year after flower pollination. In 2007, that means that pin oaks and their related red oak cousins will make up the majority of the acorn crop since the nuts we are seeing this year were mature enough to survive our late frost. 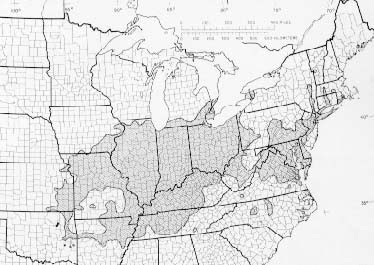 Pin oaks are found primarily in Ohio, Indiana, Illinois, Kentucky, Middle Tennessee, Virginia, West Virginia, New Jersey, and parts of North Carolina. They grow primarily in moist, poorly drained soils in lowland areas. Pin oak bark is medium gray and relatively smooth. 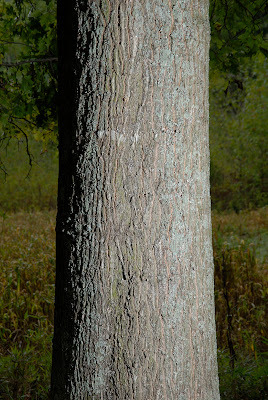 Although the leaves resemble red oak leaves, the bark is distinguishable because it lacks the striped pattern of the northern red oak. 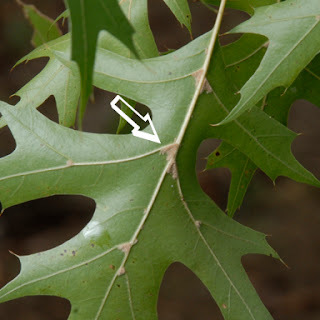 Leaves are smallish, compared to other trees in the red oak family, generally 3" - 5" long. They have deep sinuses or notches that reach almost to the vein running down the center of the leaf. They also have tufts of hairs on the under sides at the vein junctions (where the arrow is pointing). 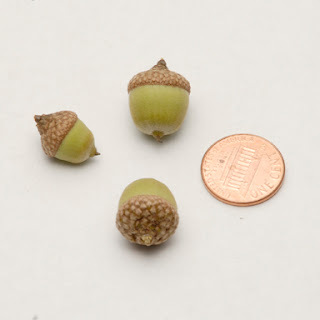 Acorns are small (about 1/2" in diameter) and nearly round with a shallow cap that encloses just the top portion of the acorn. If you are looking for a handy field guide that you can throw in your pack the next time you are out scouting, I recommend either or both of these books. I use both because often one will have a better photo or illustration than the other and two points of reference always helps. If you don't want to spend the cash for two books, I'd give a slight edge to the Peterson's Guide. Next post: the Blackjack Oak. Reds or Whites - Which Goes Best With Deer?